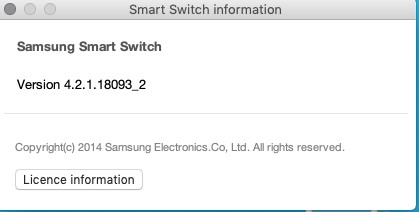 Samsung support have informed me that Smartswitch does not work with the later versions of Mac software. I have High Sierra 10.13.6 and it does not connect. I was told this was a known problem which had been passed to the app development team but they were unable to tell me how or when this problem was going to be fixed. I find this incredible that you cannot backup this phone to apple mac and would like to know if anyone knows what is being done to fix it. I have only had the phone a few weeks switching from an iPhone 6 and had I known about this I would not have bought the phone. Also it took me 3 phone calls to support and a visit to a service centre before they admitted this problem. I moved this from the old Galaxy Nexus forum to the S9 forum. macOS Sierra 10.12, Mac OS X 10.11 El Capitan, 10.10 Yosemite, Mac OS X 10.9 Mavericks, 10.8 Mountain Lion, 10.7 Lion, 10.6 Snow Leopard. Yes I have successfully used Android File Transfer to transfer photos from my Galaxy S9 to my AppleMac, however I wanted to hold a backup of my phone on my Applemac and this does not work. Are those the stickers we use in texts too?